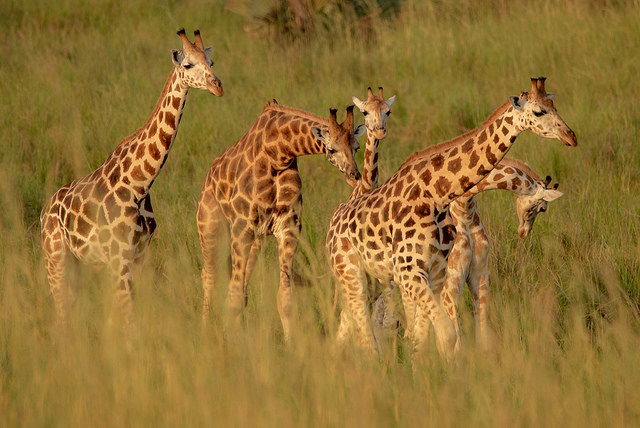 Book your safari to Uganda's top national parks. Book your safari to Rwanda's top destinations. Kenya Safaris, Tanzania Safaris and Congo Tours. Enjoy Gorilla trekking Safaris to Uganda, Rwanda and Congo organized by Adventure in the wild safaris. Our website offers reliable information about Gorilla trekking and wildlife safaris in Uganda, Rwanda Gorilla trekking or Congo gorilla tours. Learn more about Uganda Gorilla Trekking costs, Uganda Gorilla families to trek, what to pack for your gorilla trek, Best time to visit the mountain Gorillas, Mountain Gorilla diet, and Booking Gorilla trekking permits. Our Gorilla tours can be Budget, Mid-range, or luxury basing on the accommodation you prefer during your Gorilla safari. Send us an inquiry and we shall send you the best offer for your desired tour package. Browse our Available: Uganda Gorilla tours, Rwanda Gorilla tours or Uganda safaris. Visit the bwindi Impenetrable forest and track the endangered mountain gorillas and also visit lake Bunyonyi. 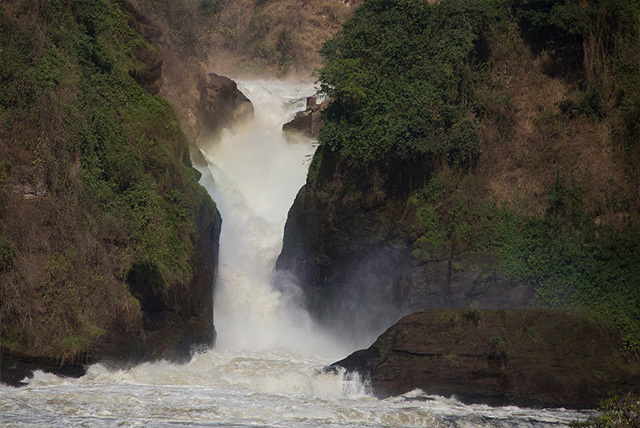 A 3 day wildlife adventure safari to Murchison falls NP where you will visit the falls, enjoy a boat cruise, & 2 game drives. Explore the best of Uganda wildlife and primates in a thrilling 7 day safari tour. Wildlife, Gorillas and chimpanzee. 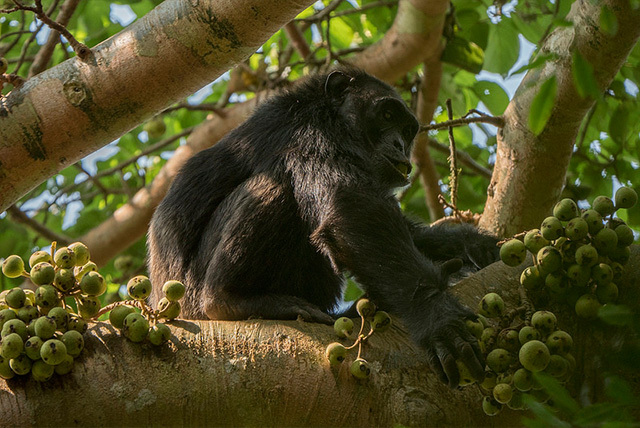 This six day Primates experience in Uganda takes you for Chimpanzee and Gorilla trekking with cultural highlights. This tour takes you to Queen Elizabeth National Park for a wildlife adventure and to Bwindi for gorilla trekking. Trek the Uganda Gorillas while starting your trip from Kigali, Rwanda. This is a relatively cheaper gorilla trekking safari. Travel across Uganda “the pearl of Africa” visiting the top tourists attractions and national parks on this 12 day safari. 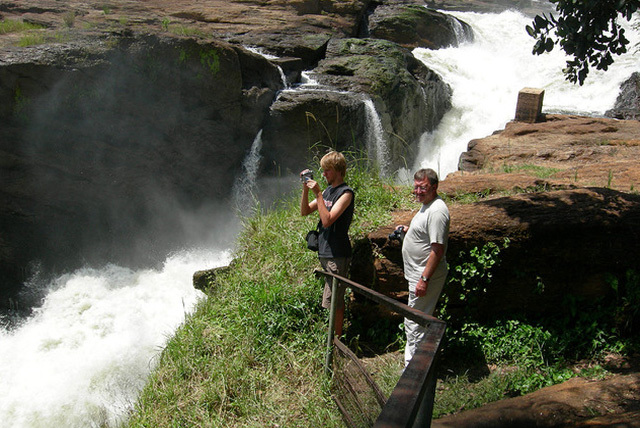 This short trip takes you to Murchison Falls national Park for a thrilling wildlife and adventure experience. Have you had Rwanda gorilla trekking and wildlife adventure in your bucket list? Browse our packages and choose the best safari option and have it tailored to fit your adventurous desires! Explore the volcanoes national park, Nyungwe national park, Akagera National Park, genocide memorial center and other Rwanda attractions with us. Visit volcanoes national park in Rwanda, and enjoy a once in a lifetime gorilla tracking experience. Explore the best of Rwanda primates, track the Gorilla’s, Golden monkeys and Nyungwe chimps. Enjoy a thrilling 5 days Akagera wildlife & Volcanoes gorilla trekking experience in Rwanda. Gorilla trekking in Uganda, the “pearl of Africa” is fantastic compared to any other experience in Africa. The environment of the trek through the jungle is unbelievable. With each movement ones expectations develops and the reward of sighting the remaining few gorillas in the world is amazing. The location, Bwindi Impenetrable National Park is confirmed one of the most fascinating in all of Africa. 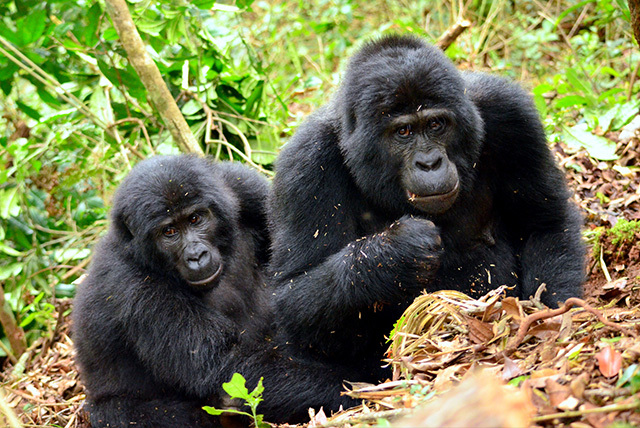 It was gazetted as national park in 1991 with the mubare group as the first group of gorillas in 1993. It has been confirmed that as a result of poaching, there has been a reduction in the number of gorillas all over the world. In total there are 1000 mountain gorillas in the world as per the 2018 census with Uganda holding 50% of the total population. To see the gorillas is spectacular because the tourists are get to see them in their natural habitat. 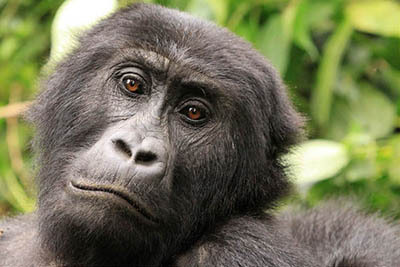 so get an opportunity to go gorilla trekking in Uganda with the largest population of mountain gorillas in the world. What is gorilla trekking in Uganda? Gorilla trekking in Uganda is a long walk into the thick forest like Bwindi Impenetrable National Park in search of the gorillas. The hike involves getting a bit untidy, getting tired and travel into the bush through the “impenetrable” forest with an experienced local guide to find a family of habituated gorillas. Gorilla trekking is awesome and leaves tourists with unforgettable story to narrate in life. Where mountain gorillas are, in Uganda. Mountain gorillas are found in the Virunga Mountains in DRC and Rwanda as well as in Bwindi Impenetrable National Park in Uganda. Worldwide, Uganda contains of 50% of the total mountain gorillas left with about 450 of them living in Bwindi Impenetrable National park. Bwindi is well known for gorilla trekking in Uganda and it is located in the southwestern part of the country and its one of the most popular national parks in East Africa. Bwindi is divided into four sectors : Buhoma sector, Nkuringo sector, Rushaga sector and Ruhija sector. These sectors have an impressive array of luxury lodges and campsites as well as restaurants, craft stalls and guiding services. Buhoma sector in the north. Ruhija sector in the east. Ruhija sector has the following group of gorillas; the bitukura group which was named after a river in which they were first seen and it consists of 12 members including 4 silverbacks. The sector contains accommodations like, Ruhija gorilla safari lodge, Ruhija gorilla mist camp’ Trekkers Tavern mist camp AND Ruhija gorilla resort. Rushaga sector in the south. Rushaga is composed of nshongi gorilla family, mishaya family, kahungye family and Bweza family group and visitors can settle at Gorilla safari lodge and Chameleon hill lodge. The starting point depends on the Gorilla group to which you have been assigned. Some groups start their trek from headquarters of the particular sectors (Buhoma, Rushaga, Ruhija or Nkuiringo) while others have to drive into the forest as a starting point but in most cases tourists do not know where their trek will start from not until the day of trekking. Once in their starting points, tourists are supposed to follow their respective ranger guides who will lead them through the thick forest. Armed guards are also provided for security. Coming across these gorillas can take the time interval if one to five hours or even more because the trekkers have to figure out where the gorillas have moved to day by day. The trek is relatively hard but tourists in a good body shape and health would enjoy gorilla trekking in Uganda so much. But if a tourist is uncomfortable carrying their luggage during the trek, he/she can hire some of the local porters from surrounding villages ant they cost $15 a day with a tip for example the friendly BATWA community . After finding the gorillas, tourists are expected to observe, ask questions, take photos and videos of the animals though eating or drinking and flash photographs are prohibited. Secondly tourists should not walk closer than seven meters to the gorillas because they are highly considered to be susceptible to human diseases. This is to ensure your safety while trekking the gorillas. After about an hour, tourists are supposed to trek back through the forest because too much time of staying with the gorillas can make them suspicious and uncomfortable about the environment. Gorilla trekking is done throughout the year and gorilla trekking permits are issued day by day but most tourists enjoy trekking during the dry months of the year which is January-February and May-September. During these months, the land is drier though some little rain drops are experienced but its more comfortable for the tourists due to the less muddy conditions and clear sky. The permit cost for gorilla trekking in Uganda is $600 per person and gorilla habituating is $1500 per person. 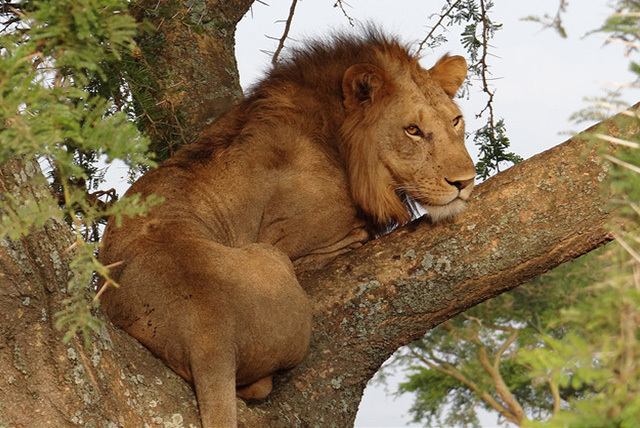 The permit can be got from Uganda Wildlife Authority through us at Adventure in the wild safaris. Rwanda’s $1500 whereas the cost for DRC is $400 due to recorded political instability in the country. The most convenient way of getting a gorilla trekking permit is by going with a local operator of Bwindi impenetrable national park like Adventure in the wild safaris. However tourists are advised to Adventure in the wild safaris earlier before the travel such that we can check tell you the Gorilla Trekking permit availability and thus reserve it for you. Uganda generally experiences two dry and wet seasons. However Bwindi impenetrable national park is a little moist even during the dry season because of the nature of Bwindi National Park being a tropical rain forest. Tourists are advised to carry at least two long sleeved shirts, lightweight and waterproof safari clothes, binoculars, gardening cloves, insect repellent with DEET, and a good sized back bag for keeping in all your belongings. Cameras are also recommended for taking pictures and forever have a sweet memory of the unforgettable adventure in Uganda. Walking sticks are provided at your respective campsites and lodges by the local operators to enable easy penetration into the “impenetrable” national park. The money raised from tourism is used to conserve the few remaining gorillas in Uganda since these animals are highly endangered. This has promoted to an increase in the number of mountain gorillas of lately. I would like to add on the power to save these gorillas is in the tourist’s hands only by visiting them. Part of the money is also given to the surrounding local communities in Bwindi to promote education and provision of food. The Democratic republic of Congo offers a unique experience in the Virunga jungles where you can truly explore one beauty of Africa. The virunga national park is home to the Congo mountain gorillas, and the Nyiragongo active volcano. 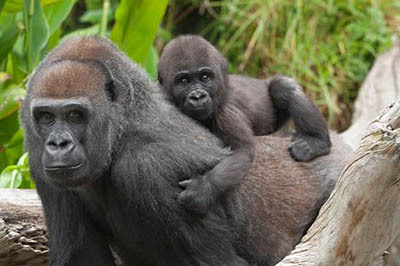 Unlike Uganda and Rwanda, congo also has the lowland gorillas which you can visit in Kahuzi biega. An amazing 4 day Virunga safari, hike Nyiragongo and track the Congo mountain Gorilla. 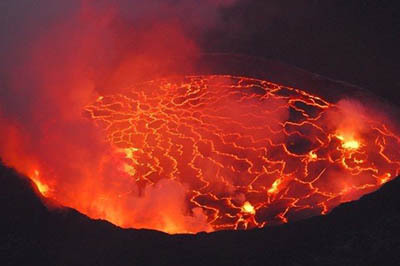 Hike the Nyiragongo active volcano in a thrilling 3 day Congo adventure trip in Virunga national park. 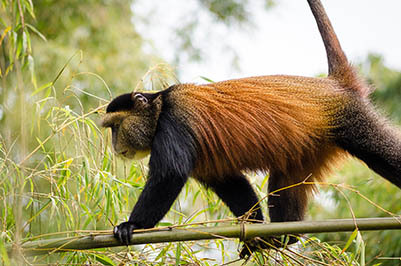 Explore the best of Uganda wildlife and primates in a thrilling 7 day safari tour. Gorilla Trekking is one of the top activities that brings travelers to East Africa. The mountain Gorillas are an endangered primate species, with less than 900 mountain gorillas left on the planet and as such they are listed on the IUCN Red List of Threatened Species. Gorilla trekking is a tourist activity in which travelers hike through the thick tropical rainforests of Bwindi forest national park, Volcanoes, Mgahinga and or Virunga national parks in search of the endangered mountain gorillas. There are only three countries in Africa where you can go mountain gorilla trekking that is Uganda, Rwanda and the democratic republic of Congo. In order to go gorilla trekking, a gorilla permit is required, which should be secured in advance. Gorilla trekking starts early in the morning with briefing by the ranger guides about the Gorilla trekking rules, after which you grouped into trekking parties of 8 and assigned a specific mountain gorilla family to trek. You then head into the thick forests guided by the parks ranger guides, following the mountain gorilla family based on its last known location or where the gorilla group spent the night. The gorilla trek lasts from 30 minutes to 3 quarters of the day, and you should therefore be ready for any experience. After you finally meet your mountain gorilla family, you will be allowed a maximum of 1 hour with the Gorillas, in which you will take photos, observe the mountain gorillas and also ask the ranger guides any question about the gorillas. Gorilla trekking has been described by some travelers as “a once in a lifetime experience” and it should be on your bucket list of things to do in Africa. When is the best time of the year to trek the Mountain Gorillas? Many times travelers ask the question “when is the best time for Gorilla trekking?” The Mountain Gorillas can be trekked all year round in Rwanda or Uganda however given the cost of the Gorilla trekking permit (Rwanda $1500, Uganda $600) everyone would want to travel during the time of the year where they can get the best value for money and best gorilla trekking experience. It is therefore important to note that the drier months of June, July, August, September, December, January and February are the best for gorilla trekking. During this period the trek is very enjoyable as it’s very easy to navigate through the dense forests of the Bwindi impenetrable forest national park and the volcanoes national park, the forests are not dump and wet, there is less mist, and it is not very cold. However it is also good to note that since these are tropical rain forests, once in a while even in these dry months, there can be little rain. In order to see the mountain gorillas, you are required to secure the gorilla trekking permit. The tour operator usually secures for you this trekking permit after you book your trip, and is also able to tell you availability of the gorilla trekking permits before you book the trip for your intended travel dates. The Uganda Gorilla trekking permit costs $600 for foreign nonresidents, $500 for foreign residents, and 250,000 shillings for East African citizens. 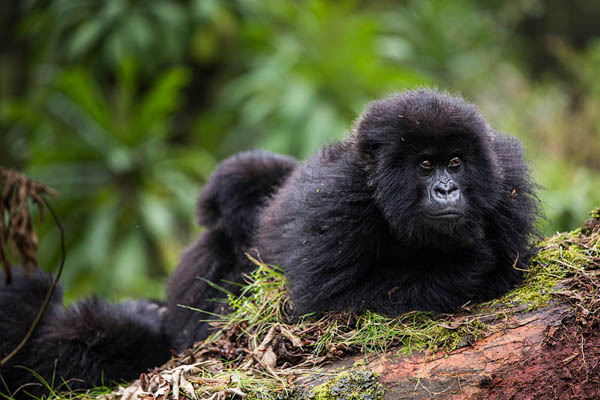 The Rwanda Gorilla trekking permit on the other hand costs $1500, and is available for a discounted fee of $1050 for low season months, and also if you visit several parks in Rwanda. Each country has an issuing body, in Uganda it is the Uganda wildlife Authority (UWA) that issues the gorilla trekking permit, while in Rwanda it is the Rwanda Development board. The Gorilla permits in Uganda allow you trek the gorillas in Bwindi Forest national park or Mghahinga gorilla national park while for Rwanda allows you trek the gorillas in volcanoes national park. Note that the gorilla trekking permit is valid for the booked date only. When should I book my gorilla trekking permit / tour? The Bwindi impenetrable forest national park is home to half of the world’s mountain gorilla population, making it a great destination for your gorilla trekking tour. Located in south western Uganda, the Bwindi national park is sub divided into for sectors, each having several habituated gorilla families available for you to trek. The for sectors of Bwindi are, Buhoma sector located in the north of the park (also the first sector to be opened for gorilla trekking), the Ruhija setor in the east, the Rushaga sector in the south, and the Nkuringo sector also in the south. The choice of sector to track the gorillas in Bwindi is determined by several factors including availability of the gorilla trekking permits, choice of lodge, desired gorilla trekking experience etc. The gorilla permit allows you trek the mountain gorillas in the Bwindi forest national park or Mgahinga gorilla park or volcanoes national park. The trek in search of the mountain gorillas lasts from 1 to 8 hours depending on several factors including but not limited to location of the trek, altitude of the sector, physical ability of the trekkers, movement of the mountain gorillas etc. However upon meeting the mountain gorillas, the gorilla trekking permit allows you spend a maximum of 1 hour with the mountain gorillas. It is also important to note, that part of the gorilla trekking permit fee is used to do gorilla conservation work, park is used to build infrastructure around the parks, and a portion is used to develop the local communities. Therefore when booking your gorilla tour, you are directly participating in the conservation of these endangered species! What age is allowed to trek the mountain gorillas? The lower age limit for gorilla trekking in Uganda or Rwanda is 15 years. However under exceptional circumstances, we can secure for your child the gorilla trekking permit if their physical appearance can pass for fit, even if they are below the permitted age for gorilla trekking. 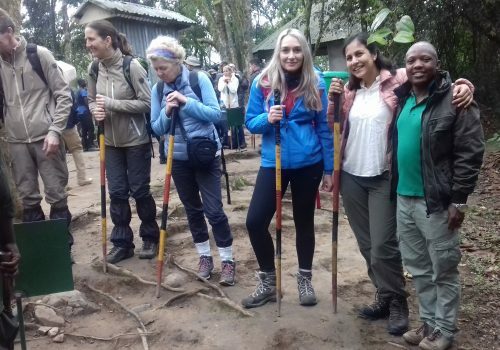 There is no upper age limit for gorilla trekking, and it’s important to note that we at Adventure in the wild safaris can arrange for you to trek the shortest/ easiest trekking group lasting between 30 minutes to 1 hour of trek, before seeing the mountain gorillas for 1 hour. Therefore don’t worry about not being able to track the mountain gorillas, contact us and basing on the details you give us, we shall plan the best gorilla trekking trip for you! The trek in the thick tropical rain forest of Bwindi, Mgahinga and volcanoes national park in search for the mountain gorillas can last from 30 minutes up to 8 hours! The length of the gorilla trek depends on several factors including but not limited to the movement of the mountain gorillas, physical abilities of the trekkers, the altitude and location of the trekking sector, the last known location of the specific mountain gorilla group being tracked etc. The pace of the group is determined by the slowest member in the trekking party as no one is left behind. It is also important to note that we can help you plan the ideal gorilla trekking tour by helping you chose the best sector depending on your desired length of trek and experience. What to pack for your gorilla trekking tour? Many times tourists ask about the chances of seeing the mountain gorillas during their gorilla trekking tour. It should be noted there is about 99% chance of seeing the mountain gorillas during your gorilla trek in Uganda or Rwanda. This is because the habituated gorilla families are closely monitored, and the ranger guides are always in the know of the whereabouts of each gorilla family. Therefore even before you go out for the gorilla trek in the morning, the ranger guides always track the gorillas beforehand and you track them based on their last known location and or movement. Please contact us at Adventure in the wild safaris if you are interested in finding out more information about the chances of seeing the gorillas. Before gorillas families are made available for gorilla trekking, they are habituated by researchers and scientists at the gorilla parks. The habituation means that gorillas are slowly by slowly introduced to human presence, such that they become used to some little human presence. This makes them less shy, and less aggressive thus allowing that group to be tracked. 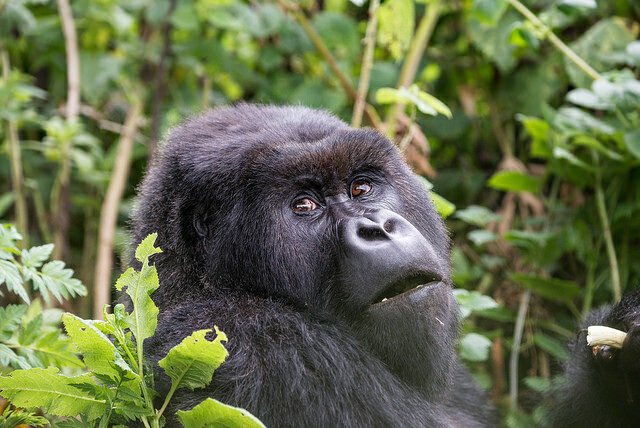 For tourists looking for a habituation experience, note that you will visit the gorilla family being habituated in the company of park rangers and researchers. During the gorilla habituation, you will spend a maximum of 4 hours with the mountain gorillas, with the experience starting very early in the morning when the gorillas have just woken up. 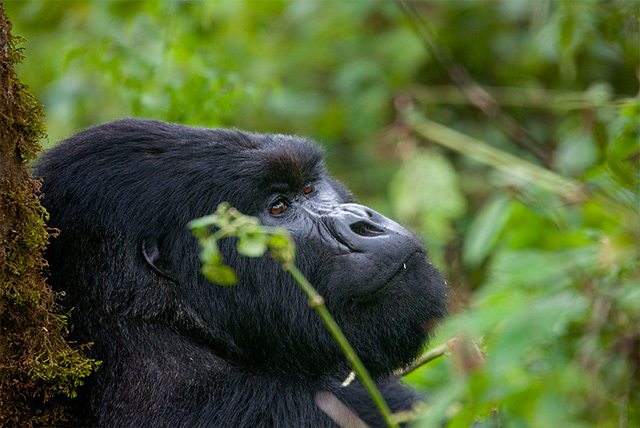 The Gorilla habituation experience permit costs $1500 in Uganda and currently there are two available groups or habituation in the Rushaga / Nkuringo sectors of the Bwindi impenetrable national park. I want to visit the Uganda gorillas via Kigali, is it possible? It’s very possible to visit Uganda, or the Bwindi impenetrable forest for gorilla trekking via Kigali. 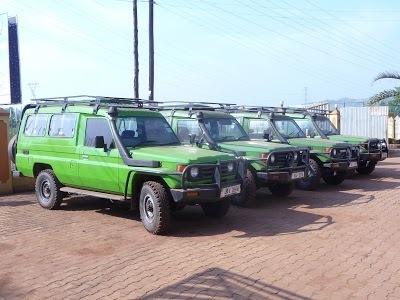 The driving time from Entebbe to Bwindi is 10 hours, while the drive from Kigali to Bwindi is only 4.5 hours, therefore many people are opting to visit the gorillas through Kigali. Therefore if you are flying to the Kigali international Airport in Rwanda, feel free to book your gorilla trekking tour with us. You can also start your tour in Kigali and end in Entebbe and vice versa if you have more activities you want to do / intend to visit more than just the gorillas. It should also be noted that the East African tourist visa can allow you access these countries with ease. 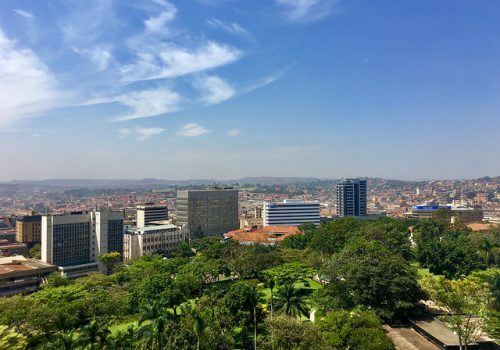 The East African tourist visa costs $100, and we advise you to buy if you plan on visiting any two or all of the three east Africa countries of Uganda, Rwanda and Congo. Does Rwanda have discounted gorilla trekking permits? Yes, there are discounted gorilla permits available to see the mountain gorillas in volcanoes national park. 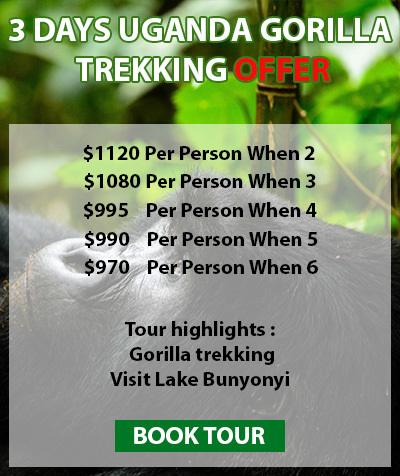 These discounted gorilla trekking permits can be secured at only $1050 for the low season months of May and November, but the only condition is that you spend three days in anyone of the other national parks in Rwanda (Nyungwe forest national park or the Akagera National park). It’s also important to note that as of 2017, Uganda abolished the discounted gorilla trekking permits and therefore to see the mountain gorillas in Uganda, you have to part with a fixed fee of $600 for the Uganda Gorilla permit. The Virunga national park is one of the four national parks where you can go for a gorilla trekking tour. The Virunga congo gorilla trekking permits costs $400 dollars, however occasionally the park offers discounted gorilla trekking permits for $200. The Virunga national park is however currently closed and will reopen for business in 2019. Contact us for more information about Gorilla trekking in Congo, Congo gorilla trekking permits etc. When should I book the discounted Rwanda gorilla permits? If you are planning to travel in the low season months of May and November when the Rwanda discounted gorilla permits are at USD1050, we advise that you book your trip at least two months in advance. This is because many people now book their trip to volcanoes national park during this period. Please contact us at Adventure in the wild safaris to book your Rwanda low season gorilla trekking tour. The specified number of people to trek / visit a mountain gorilla family per day is 8. The Bwindi national park has 14 habituated Gorilla families which you can trek based on the sector you are given, Mgahinga Gorilla national park has 1 gorilla family available to trek, while Rwanda’s Volcanoes national park has 10 habituated gorilla families available to be trekked. Once in a while, a group might have more than 8 people assigned, the park warden explains this incase it happens. On the other hand, the maximum number of people assigned to a gorilla family during the Gorilla habituation experience is four. This is because groups being habituated are not used to seeing a lot of people and may become aggressive if the feel threatened. The Gorilla habituation experience is a longer version of the gorilla trek, where you spend a maximum of 4 hours with the gorillas instead of just 1. The Gorilla habituation experience was introduced in 2014 for gorilla enthusiasts to experience the process in which wild mountain gorillas are habituated (introduced to human presence) such that they can be available for gorilla trekking. The gorilla habituation permit in Uganda costs $1500 USD, and only 4 people per day are allowed per gorilla family being habituated. Gorilla trekking is one of the best activities to do while on your tour to East Africa, the gorilla trekking permits therefore tend to sell out very fast and we therefore advise you to book your gorilla trekking tour 3-4 months early or even earlier to ensure that your permits for the preferred travel dates are secured before they run out. It’s also important to note that for the peak season months of June, July, August, September, December January and February, the permits usually get sold out and thus if you are planning your Uganda gorilla trekking tour or Rwanda gorilla safari during this months, you have to book the trip early. Do you have any other questions about Gorilla’s? If you have any other questions about the mountain gorillas that you need answered, feel free to contact us such that we can help you plan the best gorilla trekking experience. We reply to our emails within the shortest time possible, and also have a WhatsApp hotline +256753750983 in case you want faster answers / chats. Why Travel With Adventure in the wild safaris? 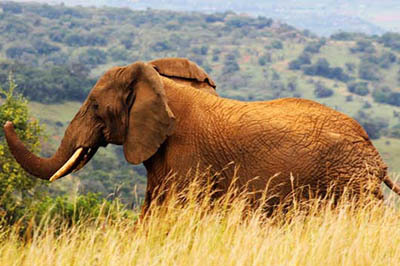 Are you looking for a wildlife or adventure safari to Uganda, Rwanda, Congo, Kenya or Tanzania? Then you are in the right place. 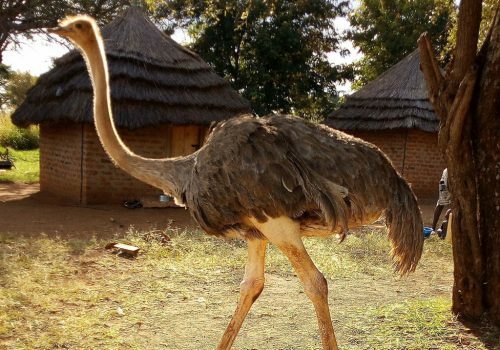 The East African region offers the ultimate African safariexperiences with several attractions for you to savor, and lots of activities for you to participate in while you unwind in Africa. It’s therefore recommended that every traveler visiting East Africa uses the services of a local and experienced tour company that truly understands the region so as to fully enjoy their trip here. At Adventure in the wild safaris, we have over 10 years’ experience organizing gorilla trekking safaris, wildlife adventure trips, volcano hiking tours and volunteering trips to Uganda, Rwanda, Congo, Kenya and Tanzania. We offer several Uganda safaris, Rwanda gorilla trekking tours, Kenya safaris, Congo tours and Tanzania safari packages which can be customized to fit the expectations of each individual client. We are also experts in organizing group tours, where we have several scheduled trips with guaranteed departures available for those seeking to join groups. Collectively, Uganda, Rwanda and Congo are the only three countries in the world where you can see the mountain gorillas in their wild habitat, we therefore offer a variety of gorilla trekking tours, which allow you explore the world of the endangered giants, the gorillas. News, updates and travel advice to help you plan your trip in East Africa.